Yee-haw! Gift Horse & Co. subscriptions are now available! GH&Co. 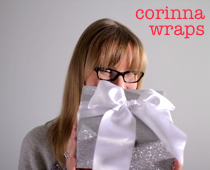 is my newly launched gift wrapping subscription-box service. Every other month, members will receive a box filled with beautiful gift wrapping supplies, hand-selected by yours truly. So if you’ve been eying all the gorgeous gifts I’ve shared on this blog and wished you could find such stunning papers, ribbons and embellishments, now’s your chance to get my top picks delivered directly to you. Subscriptions are $37 Canadian, plush shipping and handling. Visit Gift Horse & Co. to subscribe — first two people to sign up get a special gift! How much fun would it be to open up a box of beautiful wrapping supplies… every other month! I am smiling just thinking about it!! That’s a gorgeous selection of packages – what fun to get that in the mail!